With the summer holidays nearly over it’s all about the seals from here on in….. THE WEST WALES SEAL CENSUS – The last full seal survey was completed in 1995 when it was estimated that 5,000 animals made up the west wales population and that approx 1300 pups were born each year. This was a massive piece of work carried out over 3 years and funded by what was then Countryside Council for Wales (now NRW). The survey involved making counts of pups on every beach and in every cave between Caldey Island in the south and Aberystwyth in the north. Boats and surveyors in dry suits were deployed throughout the autumn to swim ashore at many inaccessible sites including all the caves around Ramsey every few days. Due to the expense, disturbance and mammoth effort involved in this survey, it is unlikely to be repeated anytime soon. Since then we have monitored 9 beach sites around Ramsey that we can view from the clifftop instead. 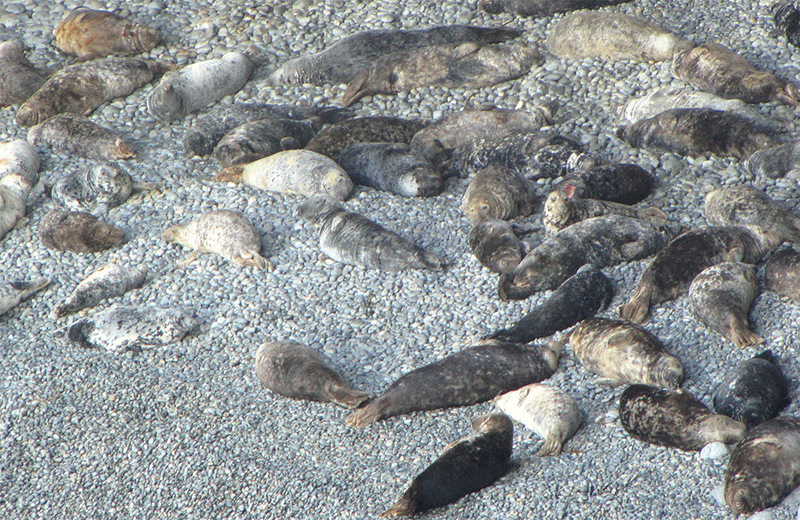 OVERCROWDING – The seal pupping season on Ramsey has a very rapid start increasing quickly from late August to mid September, followed by a very long ‘tail’ with late pups born into early December. In 2015 the number of pups on Ramsey’s beaches peaked on 24 September, with 150 pups present on our nine beaches on that day (72 of these were on Aber Mawr alone). This was followed by a second peak two weeks later on 8 October.